The TEL&AV team have created a modern and sleek interactive guide for setting up meetings via Outlook. The guide walks you step by step through each of the processes and guides you using images, videos and interactive segments where you recreate the process within the tool. Skype for Business (part of Microsoft’s suite of collaboration tools) is now available to all University staff. Skype for Business allows staff to easily communicate with colleagues within the University and with external contacts using Instant Messaging (IM), video conferencing and screen or application sharing. 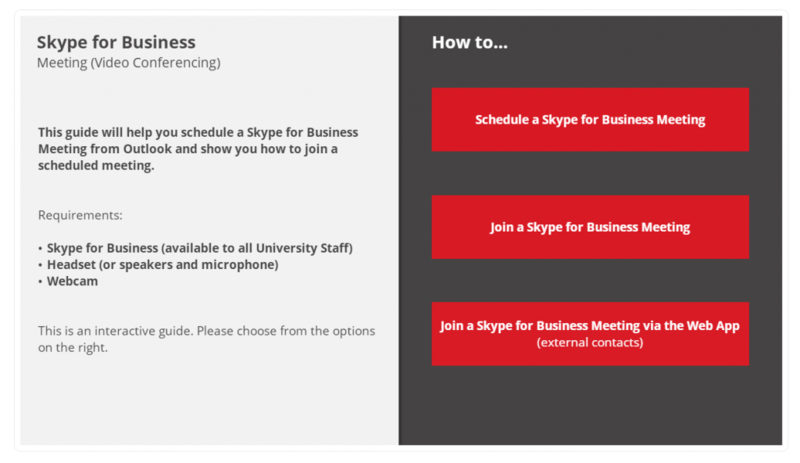 For full information, including how to download and set up, please see the Universities Skype for Business webpage.